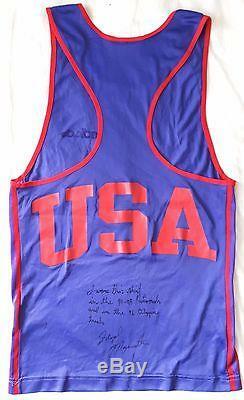 Floyd used the vest in the 1994 & 1995 National Golden Gloves and during the 1996 Olympic trials. Authentication comes in no better form than the hand of Floyd himself. 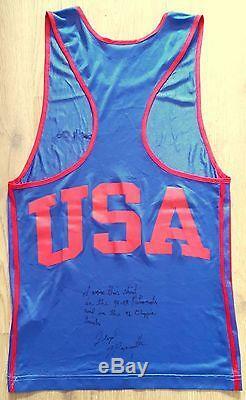 On the back of the vest he's written in black marker pen "I wore this shirt in the 94-95 Nationals and in the 96 Olympic trials". This is followed by an attractive early Mayweather signature. Fight worn items of Floyd's that have made it onto the market are few and far between, so don't miss this rare opportunity to own a piece from the earliest stages of the career of modern boxing's most celebrated fighter. 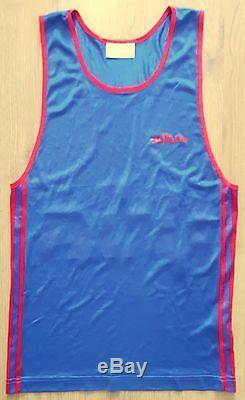 The Adidas vest is violet in colour with red trim. Adidas is printed to the front in small lettering, some of which is now starting to peel off. USA is printed to the reverse in large, block capitals. The general condition is excellent with no significant flaws. Included will be a letter of authenticity from BoxArt guaranteeing the authenticity for life. Please check out our other boxing auctions! The item "1994-96 FLOYD MAYWEATHER JR. Amateur career worn & signed USA boxing vest" is in sale since Monday, January 16, 2017. This item is in the category "Sports Mem, Cards & Fan Shop\Fan Apparel & Souvenirs\Boxing". The seller is "london_collectibles_limited" and is located in Chessington. This item can be shipped worldwide.